Two motorcyclists were killed in a crash last night in the Florida Keys. The accident involved a vehicle and a motorcycle and resulted in a fatal left turn collision. 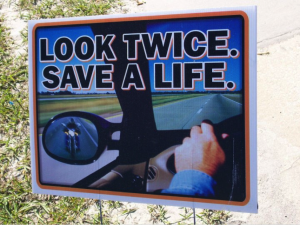 This unfortunate tragedy further emphasizes the need for awareness of the “Look Twice Save a Life” campaign. 1 More than 50% of all motorcycle crash fatalities involve a car. A majority of the time, the vehicle driver , not the motorcyclist, is at fault. There are more vehicles and trucks than motorcycles, and some motorists don’t cognitively notice a motorcycle and they “ignore” it (usually unintentionally). 2 A cycle, because it is small, can be unseen in the blind spot of a vehicle or covered by the background or objects outside of a car (fences, bushes, bridges, etc). Take an extra minute to look for motorcyclists, whether you’re turning at intersections, changing lanes or backing up. 3 A motorcycle can look farther away than it actually is. It can also be difficult to determine a motorcyclist’s speed. When looking to make a turn in an intersection or out of (or into) a driveway, assume a motorcyclist is closer than it appears. 4 Motorcyclists will often slow down by rolling off the throttle or downshifting, and by doing this the brake light is not activated. Try to allow for more stopping distance, even 3 or 4 seconds. At intersections, assume a motorcycle will slow down without any visual warning. 5 Motorcyclists often change lane position to minimize the effects of wind, passing vehicles, and road debris as well as to be seen by drivers more easily. Try to keep that in mind and to understand that motorcycles change their lane position for a reason, not to be careless or to show off or even to let you to share the lane. 6 A motorcycle’s turn signals are generally not self-canceling. Therefore some motorcyclists (beginners in particular) will forget to turn the the signal off after a lane change or a turn. It is best to be certain as possible that a motorcyclist’s signal is for real. 7 One of a motorcyclist’s better values is maneuverability. This is particularly true at lower speeds and in good road conditions. However don’t expect a motorcycle to always be able to get avoid any danger. 8 Stopping distance for motorcyclists is about the same as it is for cars. But slippery or wet pavement makes stopping fast very difficult for everyone. We should all allow more following distance behind a motorcyclist because it is impossible to always stop suddenly. 9 Look at the motorcyclist and see the guy or girl under the helmet – it could be your relative, neighbor, or friend. 10 Keep in mind, when a driver crashes into a motorcycle, bicycle, or pedestrian and causes death or serious physical injury, that driver will likely never forgive themselves. If you or a loved one were injured or killed in a motorcycle crash, you should seek the assistance of a motorcycle accident lawyer. Wolfson Law Firm is a Miami personal injury law firm located in Miami, Florida. The trial attorneys at The Wolfson Law Firm offer assistance to all motorcycle and car accident victims in Miami, Florida. If you are suffering from injuries sustained in a bicycle, car or motorcycle accident, call Wolfson Law Firm LLP. If you do not recover, you pay no attorneys’ fees. Schedule a free initial consultation today by calling us at 305-285-1115.